I remember when my first grey hair showed up on my chest. I was almost 30, and I was shocked. Really? This soon? What will happen in 5 or 10 years? I was single then, so the panicking was well justified. I took a pair of tweezers, ripped the grey hair from my chest and flushed it in the sink. I realized in that moment that not only is aging unstoppable, it can also be depressing. A couple of years went by. I started my own business, EBA Performance Makeup, got married and had my first child. At this point, the white hair started to sprout from my beard and head at an accelerated speed, the result of natural aging and genes inherited from my grandfather and father but also the stress that comes with less sleep, more bills to pay, and increased responsibilities. 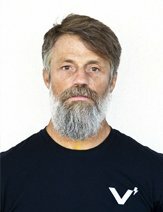 Aging had kicked in, and except for exercising and surfing, I did nothing to prevent it. I thought about using beard dye or men’s hair dye, but I could not find a chemical-free beard dye for sensitive skin, so I did nothing. It just got worse, though. When I turned 40, people started calling me “sir,” and young kids referred to me often as “the older man.” At that time I was working on a new product for the film industry designed to change hair and beard color for actors, stuntmen and performers. I was quite involved in the project and as always, tested the beard color on myself. I was shocked at what I saw! The man in the mirror did not look anything like the man I saw every day. After using the instant beard color on myself, I made a few samples to give to my friends who had been using Just for Men and Bigen beard dyes. The beard color was just as effective as those beard dyes for my friends with shorter beards and worked equally well as a beard touch up color in between beard dye applications for longer greying beards. As I explained to my friends, the beard color was designed for the film industry, where it is essential to have dye-free color that applies in seconds, looks realistic and stays on when filming under water or in the rain. The response was overwhelming! 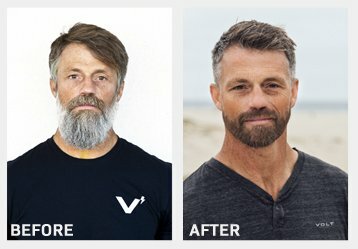 I immediately launched a mission to re-create the product and introduce it as a consumer-friendly version for all men looking for men’s beard coloring products. In 2018, Volt Lifeproof Grooming and Volt Instant Beard Color was born. I am a big fan of Volt Instant Beard Color. It changed my grooming routine and gave me a different outlook on aging. I now get my hair cut regularly, keep my greying beard trimmed and take care of my grooming needs better than ever before. I still like my greys, but I also like to change my look often. Volt Instant Beard Color allows me the freedom to be completely me or a younger-feeling version of me. What about you? Has aging got you down? Would you like to feel and look younger? To get your beast beard ever in less than 60 seconds, visit www.voltgrooming.com. This is by far the most exciting era for men’s health and aging, and VOLT Lifeproof Grooming is privileged to be a contributor. Find your shade of instant beard coloring with VOLT’s new waterproof, sweatproof, and lifeproof Instant Beard Color.